Create animated EA Transformation Roadmaps to see the impact of it strategy on the business strategy. Sign up here for a Trial Account. The Dragon1 Step-by-Step Guide is waiting for you in your Digital Workplace. What is an Enterprise Architecture Transformation Roadmap? An Enterprise Architecture Transformation Roadmap put all strategic changes into perspective. It shows the business plateaus in combination with IT plateaus changing over a period of time. It is also a calendar of planned or unavoidable changes of events. Transformation Roadmaps help everyone, but mostly CxOs to see the big picture. 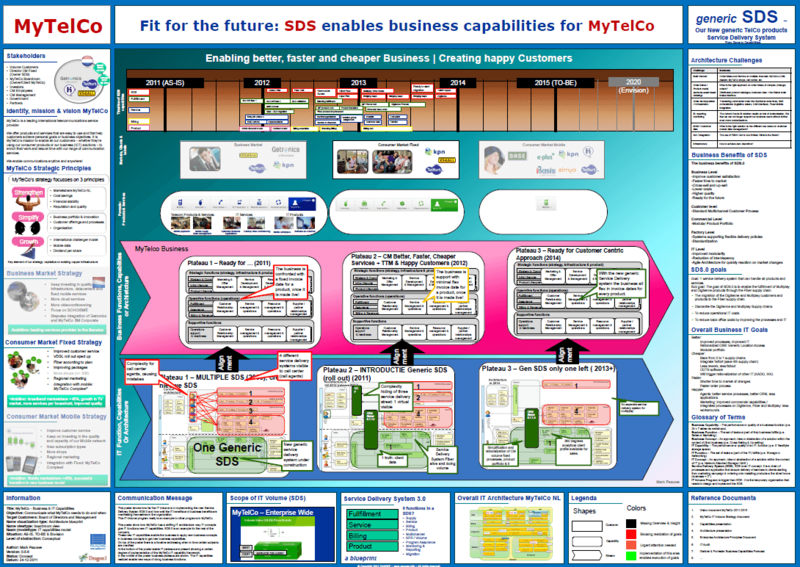 This Transformation Roadmap was created by a telecom organization supporting them in a step by step replacing old IT systems. Giving an overview of the enterprise layers and architecture plateaus, their elements and their interdependencies. Increase the quality of business planning. Communicating the status of change blocking or enabling elements in the organization. Alignment of goals for strategic management. Reporting where exactly the current situation is unknown (black holes) to management or where the situation is not compliant to standards or according to plan. Increase enterprise governance, compliancy and control. Reporting sometime ahead when and where elements are or will not be in control of the change program. Getting more in control of change. *) Benefits - these are the direct positive results of creating and having a product like this. *) Business Outcomes - these are the indirect positive results for the business of the organization because people make use of the created product. With an Architecture Roadmap available you can communicate much easier when and where there is a certain issue, situation or solution implemented in the company. Changes, transformation and context can be communicated much more effective. When you have an overview of things you can prioritize them better. Having a roadmap like this with the data in the database enables maintenance and consistency on this diagram. The Dragon1 Architecture View Layout template helps you structure and place strategy, architecture and business change information on an A0 size poster, so you can create a roadmap yourself quickly. The Dragon1 Open Enterprise Architecture Framework, reference models, views and visualizations (diagrams) help you to look for certain entity classes and other information. On Dragon you get tracking and traceability of connections, links and chains in your enterprise model. You can create an interactive/response map of your enterprise transformation roadmap with popups about information on the items you click on or move over. In the Content Viewer people can compose their own viewpoints and filter views of a enterprise transformation roadmap you publish. We hope we have inspired you to start roadmaps for your transformations. If you are pressed for time and you need a transformation roadmap in a few weeks, consider also our Roadmapping Services.